'The Anti-Christ(ian)? : Comparing Christian and Saracen Disguise in the Old French Chansons de Geste'. Paper given at University of Cambridge French Graduate Research Seminar, May 11th 2010. 'Performing the Self, Performing the Other: Gender and Racial Identity Construction in the Nanteuil Cycle' at the 19th Annual Conference of the Women's History Network, 10th-12th September 2010, University of Warwick. 'The Good, the Bad and the Godly: Saracens, Community and Communitas in Gautier de Coinci's Miracles de Nostre Dame' given at the Department of French Studies Seminar Series, 17 th November 2010, University of Warwick. 'Gender and Generation: Temporal Dislocation in Idyllic and Epic Romance', at the Gender and Medieval Studies Conference, Gender, Time and Memory, 6th-8th January 2011, Swansea University. 'Race, Ritual and Representing the Saracen in Gautier de Coinci's Miracles de Nostre Dame', at the Newberry Library Postgraduate Conference, 27th-29th January 2011, Chicago USA. 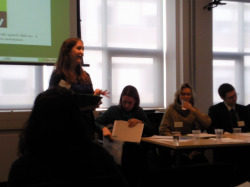 'Transcending the Faith: the Virtual Saracen in the Old French Vie des Pè res', at the University of Warwick French Postgraduate Conference, 11th March 2011. 'The Saracen Continuum: Medieval 'Race' and the Question of Semantics', Poster Presented at the Réseau-F Postgraduate Study Day, University of Southampton, 7th June 2011. 'Les Sarrasins du sud: la (re)présentation des sarrasins dans les chansons de geste occitanes', at the Xème Congrès de l’Association Internationale d’Etudes Occitanes, 12th-19th June 2011, Béziers. 'On the Problematising of Race and Gender in Medieval Literature: Some Key Considerations', Powerpoint presentation at the Warwick French Postgraduate Study Day, 24th June 2011. 'Divining Difference: Saracens and Social Order in Gautier de Coinci's Miracles de Nostre Dame,' at the IMS Symposium 2011: Ordo, 30th June-2nd July 2011, Paris. 'The Compass Always Points...East? Normativity and Medieval Orientalism', at the Réseau-F Postgraduate Study Day, University of Warwick, 21st November 2011. 2001 Group Annual Postgraduate Conference, 'Histoire(s), 5th March 2010, University of Warwick - steered the organisation committee. To view the conference programme, please click here . Attended the Emile Zola Society event, 'Zola and the Paris he Lived in' at the French Institute, London (February 2010). 'Ryght as it is ymad in France', St Hilda's College Oxford, 20th March 2010. Postgraduate Conference 'Preaching, Teaching, Manipulating', Reading, 10th June 2010. Session organiser for 'Medieval Race: Ambiguity, Conflation and Conversion' at the Leeds IMC 2012 where I will be speaking on 'Space, Place and Medieval Race: The Case of Evalach in the Estoire del Saint Graal'. 2001 Group Conference, March 2010.